Kim Melnick loves Jesus, His people and His word. She’s passionate about learning and sharing with others as she learns and grows. Her prayer journals and writing are an overflow of her experiences in Scripture, prayer and study. 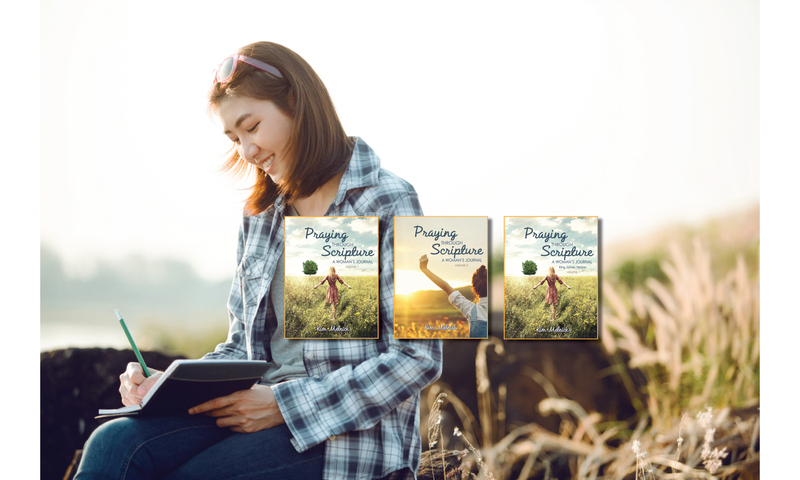 Her aim is that you would grow closer to the Lord through her journals and her writing. We tend to remember the times that God works in mysterious ways. Or, when He works in utterly amazing, miraculous ways. But, it’s easy to miss when He works in the mundane moments of our everyday life….this is a story about one of those times. Our 13 year old daughter Amanda has been asking for a puppy every birthday and every Christmas for the last 3-5 years. And my husband, Jeff, who for the past few years had declared that we were on the “pet-attrition” program had a change of heart and remembered that he had also declared (for many years) that if he ever got another dog, it would be a golden retriever. So, the decision was made and we surprised Amanda on Christmas morning, not with a puppy, but with a dog training book that let her know it was time to begin the hunt for the perfect pup. She was overwhelmed with emotion and excitement and let’s just say that we all shed a few tears the morning of December 25, 2018. We spent a few days after Christmas searching online for a puppy. We considered rescues and older puppies but ended up purchasing an 8 week old bundle of love from a local breeder. Choosing the puppy was actually a pretty easy process. Choosing a name for her, however, almost brought our family to blows. I’m embarrassed to admit how many conversations and how much time was spent amongst the family discussing potential names. Some of us were pretty low key about the name choice, agreeable to many of the potential names and open to almost all of them. Others of us……well, not so much. Amanda and Jeff, in particular, had very strong feelings about the name. Both of them would choose a name and declare it as the “perfect” name for the puppy. Jeff decided “Maggie” was the perfect name. She liked the name “Reese” which Jeff vetoed. Apparently, he wanted a two-syllable name that ended with the “ie” sound. This went on over various names, with each of them “vetoing” the other’s favorite name over and over again. Pride set in and it quickly became clear that the puppy’s name was going to require a hard-fought battle between these two. On Saturday morning, January 5, Amanda, her big sister and I took off to pick up this unnamed puppy from the breeder. My husband was out of town so he and Amanda debated the name over FaceTime for most of the car ride to and from the breeder’s home. It appeared we would never have a name for this puppy. But, finally, a compromise was reached. They agreed on the name “Riley”….a name neither loved nor hated. By this time, the rest of us didn’t even care what we named her. We were just glad the fight was over. The girls and I brought “Riley” home and cared for her for two days before Jeff came back from a long road trip. Of course, as soon as he arrived, he wanted to see “Riley.” But the next item on his agenda was to find Amanda and have a little meeting with her. The humility of my husband in that moment nearly brought me to tears. But, what happened next is where I really saw the grace of God at work. My strong (and sometimes stubborn) 13 year old girl softened. Now, that is moment where I saw the grace of God at work. You see, I have this belief that’s been expressed perfectly by one of my favorite pastors…. I interpret his statement like this…. When we do things God’s way, it not only brings glory to Him but it’s good for us. It makes life work – it doesn’t mean that life will be easy but it does mean we experience a little bit of His kingdom here on earth. And that’s what I witnessed in that moment….by reaching out in humility, Jeff broke the vicious cycle of pride and selfishness that had developed in their conversation. As soon as he stopped demanding his will, she relinquished hers as well. It was a beautiful moment for sure. Of course, he insisted on allowing her to name the puppy and that cute little puppy above is our little Reese. Her name is a constant reminder to me of how God works in the regular moments of our everyday life. Kim Melnick is a prayer warrior wannabe who encourages women to deepen their prayer life by praying Scripture. Her prayer journals can be found on Amazon. The beginning of a new year is a great time to jump-start your prayer life, but let’s face it, most of us struggle to consistently spend time in prayer. We know we should. We even want to. But, oftentimes, even when we try, we find our prayer time to be frustrating. Developing an effective prayer life requires more than desire. It requires intention and it requires discipline. Here are a few steps to upgrade your prayer life! Have a plan. Don’t count on a great prayer life just happening. Decide ahead of time where and when you will pray. Are mornings or evenings better for you? Where can you go to minimize distractions? Do you like to be inside in your favorite chair? Or, would you prefer to be outside with the sounds of Creation reminding you of God’s divine nature? Make sure your plan includes God’s word. It’s been said that the secret to a successful prayer life is to make God’s will your want – then ask for whatever you want! There is no better place to find God’s will than in His word. While we can learn about God from Creation and through fellowship with other believers, to truly dive deeply into the nature of God, you must learn about Him from His word. So, what will you read/study/pray back to God? Organize your prayers. For some, this may be simply be a plan in your head regarding who/what you pray for on certain days. For others, a calendar or notebook scheduling various prayer topics on certain days may be preferred. One creative friend of mine maintains a bulletin board with photos/images to remind her of those people and situations she wants to regularly bring to God in prayer. Record your prayers. This is a practice you will not regret. When we look back on our recorded prayers, we find clarity in seeing God that is at work around us. Without a record of prayer, we are more prone to miss the opportunity to be awed by what He is doing in and around us! Seeing His hand at work builds our faith in unimaginable ways! Meditate on God’s word. When we meditate or memorize God’s word in our prayer time, we can carry what we know to be true about God from His word with us all day long. As we encounter the inevitable trials of the day, our hearts and minds can more easily be comforted and reassured with His words. When doubts set in our faith can more easily be strengthened. And, in our most joyous moments, our praise can more easily be pointed heavenward. For years, my mission statement has been, “Learning it. Living it. Sharing it.” Those words express how I aim to do life. They are the heartbeat behind the prayer journal I published last year and behind every blog I write. Well, I learned something yesterday, I’ve lived it for just a few hours, but I believe it’s a powerful practice and I’m ready to share. Yesterday morning, I was challenged by a friend’s Facebook post to consider choosing what she called a “Waking Verse.” It’s a pretty simple idea. Choose a verse from the Bible and train yourself to make that verse your waking thought. I knew immediately the verse I would choose. It’s one that causes my heart to rejoice and praise God in good times but one that gives me hope in the dark moments of life as well. It’s a verse that comforts me by reminding me that I am not in control but He is and His power is so much greater than I can imagine. I decided that if this were to be my Waking Verse, it would need to be the screensaver on my phone. Like most of us, my phone is also my alarm clock and it’s the first thing I see each morning when I wake up. I knew that clearing my home screen of everything except this verse was the surest way to make it my waking thought. Now, when this happens, my mind and heart start racing with thoughts of how much more rest I need, the upcoming demands of the day and every difficult situation currently faced by me or someone I love. Oftentimes, these thoughts keep me awake, while I toss and turn until I finally relent and just get up. But today was different.As I grabbed my phone to check the time, I was reminded of my Waking Verse. I paused and read it. Yep, at 4:30am. As the anxious thoughts crept in, I repeated the verse in my head. I was reminded that He has the power over every situation that my loved ones and I face. I was reminded that I am not in control but He is. I remembered how many times in the past, He has already done more than I could ask or imagine. And, I remembered how He does it all for His glory! In other words, I gave every anxious thought back to Him. I praised Him for His power over each one. And, then, I fell into a deep and peaceful sleep until 6:30am. So, I challenge you to choose your Waking Verse. Please let me know what you choose and how it changes your day. I hate weeding and I’m always amazed at how quickly a patch of weeds can overrun an empty space in my garden. After many years of fighting weeds in the sunshine state, where everything green grows all year, I’ve learned that the best way to keep the weeds from taking over in my garden is to simply crowd them out with beautiful flowers. You see, I’ve learned that the weeds won’t grow where healthy plants are growing tightly together. I am so grateful that God did not design us to be lone rangers in this life. He created us, yes, for fellowship with him but also for fellowship here on earth with other imperfect humans who need us as much as we need them. These “flowers” that fight the spiritual weeds in my world are a small group of believers who are living out this journey with me. I meet at least weekly with these friends who love me, who speak truth to me and who allow me to speak truth into their lives as well. These sisters and brothers in Christ, each in their own way, help to crowd out the unwanted weeds growing in my life…. When I mention the weeds of discouragement taking root in my heart, these friends encourage and pray for me. When I speak of the weeds of doubt sprouting in my mind, they inspire me with their strong faith. When I confess weeds of sin germinating in my life, these friends remind me of who I am in Christ, remind me of his grace and inspire me to live rightly. And, when I express weeds of grief growing in my heart, these friends mourn with me, serve me and remind me of God’s goodness. I haven’t always had friendships like this in my life. It doesn’t come naturally. I have prayed for friends….wise friends, godly friends and God has provided. But, I also have learned that to have (and to be) this kind of friend requires vulnerability. It means showing up and sharing honestly about the hurts, fears and struggles of my life and how they are impacting my soul. This is not easy, but I am learning that it’s worth it. It’s worth it because vulnerability reveals our need for the Gospel and it builds intimacy in our relationships. It knits us together with others and, when we build community that allows vulnerability, we are able to better practice the love and good works that the author of Hebrews calls us to in this verse. Lord, thank you for that we don’t have to live out this life alone. Thank you for the gift of community. Thank you for those you place around us who encourage us in love and good works. Help us not to give up on each other or on the time we spend together but help us to continue to spur each other on….for our good and for your glory! If you’d like to learn more about praying scripture, check out our prayer journals. I remember thinking (but not saying), “What in the world does that mean?” His answer confused me. What did it mean to rest? I was a young mom with three children under 3 and, to be honest, I didn’t feel that any type of “resting” was in the realm of possibility at that time. Many years have passed since that conversation. Those three young children are now in college, one more has come along and she’s almost in high school. I still struggle with resting, but I have begun to understand what that wise pastor meant when he told me to rest in God. Resting in God is working at the things I know He has called me to do do while trusting that He will do the things only He can do. Resting requires the work of knowing God, which means spending time with Him….in His word and with His people. If we don’t look to His word to learn who He is, we risk creating a God of our own design. And, if we don’t spend time with His people, our view of who God is, will be limited. Resting also requires the work of trusting God. In order to trust Him, we must believe that He loves us, that He is good and that His ways are always perfect. This isn’t always easy and the more time we spend getting to know God, the easier this becomes. Since that conversation with my pastor, I have grown in my understanding of what it means to “rest” in Him, however, that doesn’t mean I’ve perfected it. God gives me situations every day that offer me the opportunity to rest in Him or not. Sometimes it’s easy and sometimes I fail. But, what I’ve learned, is that…. Resting in Him brings freedom. Resting in Him means I worry less and trust more. Resting in Him means I’m less inclined to manipulate people and situations when things don’t go my way. So, let’s ask God for an increasing ability to rest in Him. Let’s work hard to show the result of our salvation as we obey God, knowing all the while that He is working in us. To begin your journey of praying through Scripture, check out our prayer journals. On a recent vacation, our family rented a pontoon boat on a crystal clear lake surrounded by the beautiful North Carolina mountains. We added a little excitement to the experience by renting a tube to take the kids on some wild rides. The workers at the marina warned us to be careful of the many tree limbs floating in the water so, as my husband acted as Captain, our sons took their spots at the front of the boat to help their dad keep an eye out for any danger in our path. My place was at the back of the boat where I could throw out the rope and keep an eye on the tube riders. Her overwhelming trust struck me. She was not concerned with floating logs or any other possible danger or injury. She trusted her father to take her on the adventure that he’d planned for her. From her spot, behind the boat, she could not see what was coming and she didn’t know what she might experience, but she trusted her dad to give her the ride of her life. I was convicted of my own lack of trust in my Heavenly Father. So often, I want Him to show me the road ahead so that I can give my approval. I want a step-by-step plan with some nice guardrails and guarantees along the way. I want to avoid the inevitable (and sovereignly planned) bumps and detours because they remind me that I’m not really in control. I realized, in that moment, how often I trust ME over HIM even though His word tells me to trust Him and not to rely on my limited knowledge. In that moment I also realized how often I forget that all things in this life, will work for my good and His glory. And, “all things” includes the bumps and detours, the scary moments and the times I realize just how little control I have. So, my prayer is this…..
Lord, help me to trust you over me. Help me to remember, day by day, that your understanding is good and perfect and that mine is so limited. Help me to remember that you work ALL things for my good. Help me to be able to say, “Give me all you got” because I know that a life lived fully trusting in you is the greatest adventure I will ever take.